Installation shot of visiting artists residency exhibition featuring work by Jaime Angelopoulos (left) & Panya Clark Espinal (right). 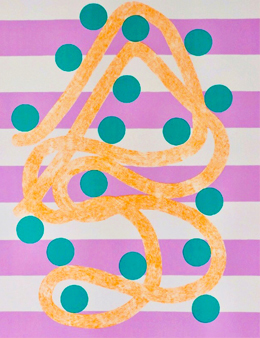 Jaime Angelopoulos, Magnetica, 2018, screenprint, 47" x 35". Printed by Nicholas Shick under the auspices of the Open Studio Visiting Artist Residency Program. Photo credit: Nick Shick. 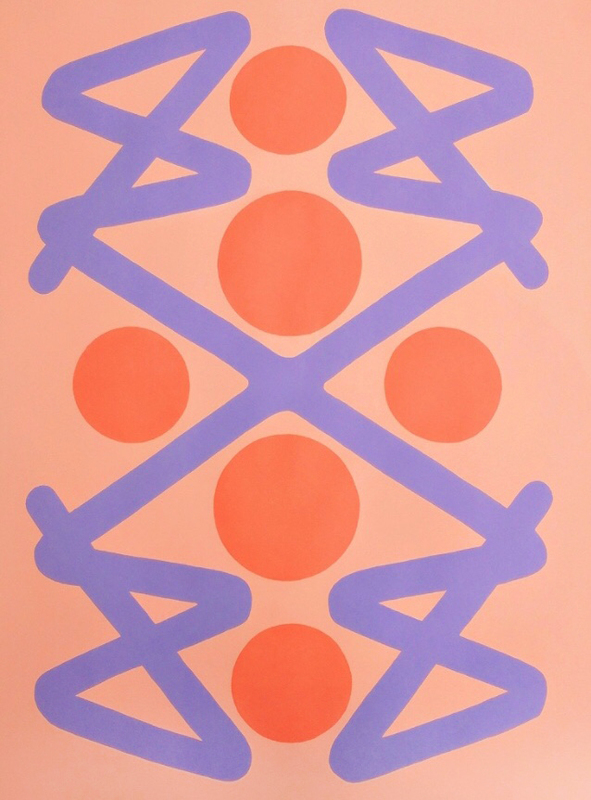 Jaime Angelopoulos, Sigil, 2018, screenprint, 47" x 35". Printed by Nicholas Shick under the auspices of the Open Studio Visiting Artist Residency Program. Photo credit: Nick Shick. 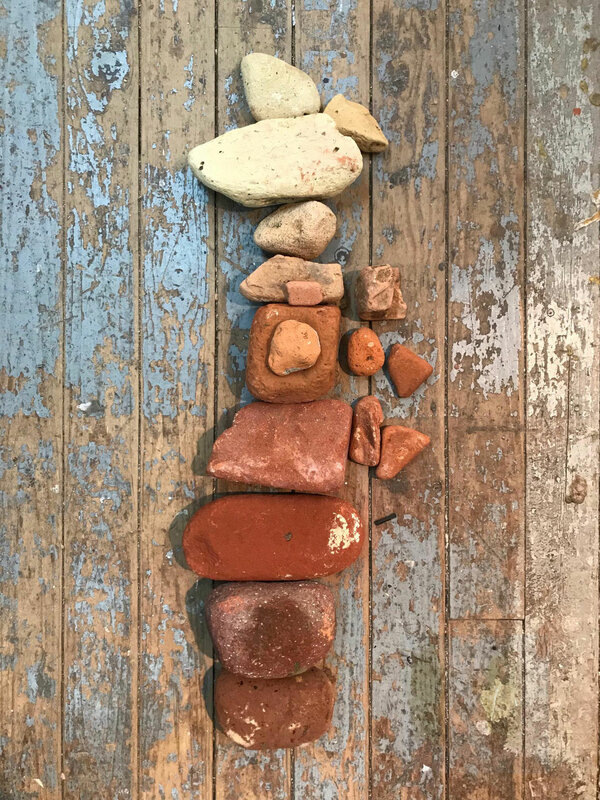 Bricks used by Panya Clark Espinal to create the pigment for her prints. Printed by Laine Groeneweg under the auspices of the Open Studio Visiting Artist Residency Program. Pigment created for Panya Clark Espinal for her new media work. Printed by Laine Groeneweg under the auspices of the Open Studio Visiting Artist Residency Program. A print by Panya Clark Espinal being pulled off a press. Printed by Laine Groeneweg under the auspices of the Open Studio Visiting Artist Residency Program. Each year Open Studio selects four professional artists with or without printmaking experience to create traditional and/or experimental works in the print medium of their choice, working collaboratively with a print media artist. The Visiting Artist Residency, in operation since 1983, is a popular program that receives applications from artists from around the world. 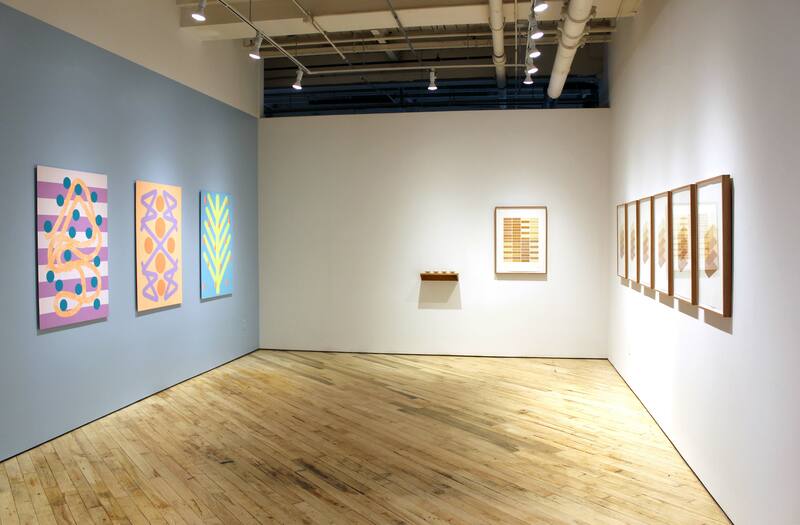 In conjunction with the residency, each artist exhibits the work produced during their period in the Studio. These exhibitions are the result of this intensive work period. The first of two Visiting Artist Residency exhibitions in 2018 will feature work by artists Jaime Angelopoulos and Panya Clark Espinal. In Alter, Jaime Angelopoulos presents three large-scale screenprints within a monochromatic pastel blue installation. Magnetica consists of a lavender striped background, upon which a neon-orange ‘serpentine’ silhouette is juxtaposed. The ‘serpent’ appears at odds with the heavy geometries that contain it, speaking poetically to interpersonal and intrapersonal intention and outcome. Sigil offers a symmetrical arrangement in lavender, fuchsia and luminescent orange. A large centered ‘X’ with radiating circles creates a meditative and harmonious composition, symbolizing peace and protection. Finally, Planted depicts a large neon-yellow ‘tree’ with contoured stem and radiating branches. A rich turquoise background creates an optical tension, while lilac droplets sprinkle over the entire composition. This print series continues Angelopoulos’ interest in evoking social experience through bodily gesture and bold coloration. Jaime Angelopoulos is a Toronto based artist working in the mediums of sculpture, drawing, collage and installation. She received an MFA from York University, BFA from NSCAD University and also studied at Meadows School of the Arts in Dallas. She was awarded the Hazelton Sculpture Prize in 2013 and has participated in artist residencies at KulttuuriKauppila Art Centre in Finland and the Banff Centre for the Arts. Her work has been included in exhibitions and art fairs in Canada, USA and Europe with recent solo exhibitions at Parisian Laundry (Montreal), MKG 127 (Toronto), Musee Regional De Rimouski (Quebec) and the McLaren Art Centre (Ontario). To view more print work by Jaime Angelopoulos, please visit the Open Studio online store by clicking the button below. 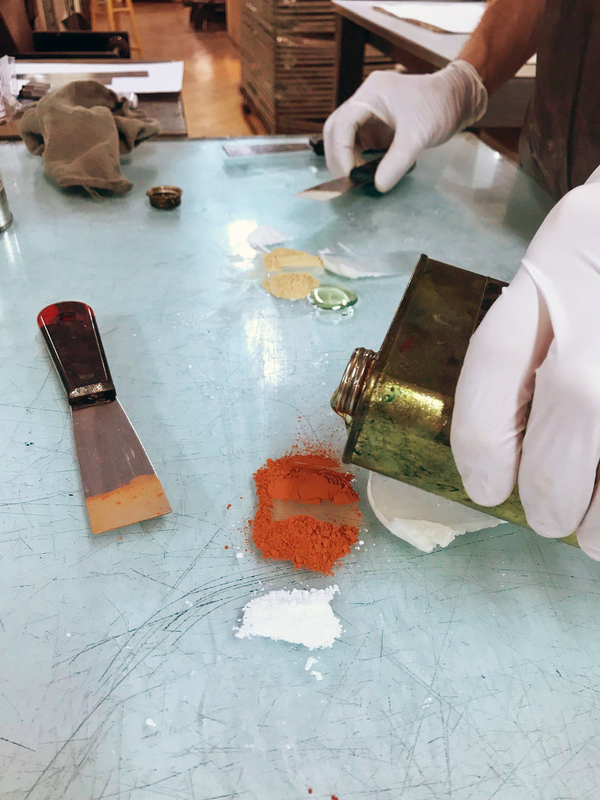 Material Redistribution is an experimental project series that explores the possibilities of employing powdered brick as pigment in printing ink. Inspired by Jason Logan’s urban foraging in the creation of his Toronto Ink Company pigments, Clark Espinal collected vintage brick fragments from the shores of the Leslie Spit and with the assistance of Printmaker Laine Groeneweg, was able to formulate a print medium. 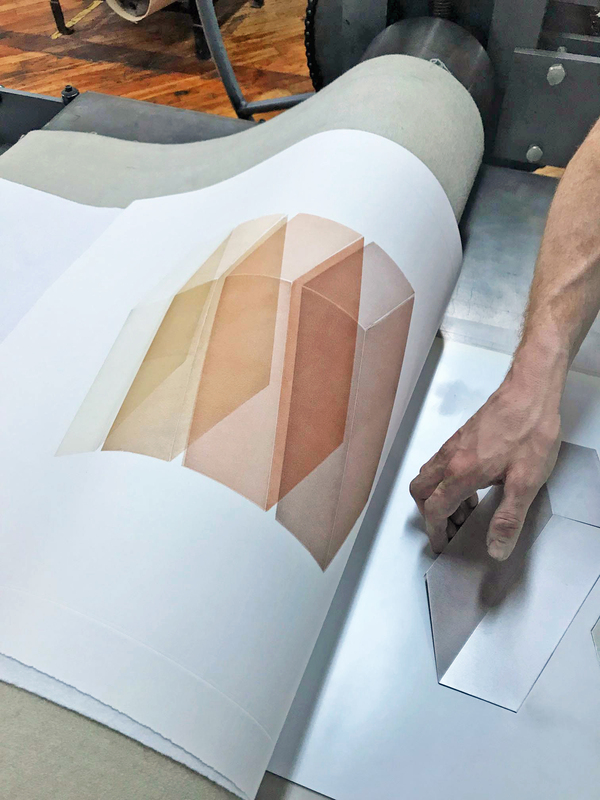 In a simple but labour-intensive process, images were produced by rolling this new media onto geometric aluminum plates, building up colour density with multiple passes through the press. Here, forms that once signaled settlement float in a state of suspension. Material Redistribution considers the cyclical, transformative, and regenerative possibilities of materials and our relationships to them. Once a city built of wood that was susceptible to fire, Toronto became a city of brick with 34 brickyards within its proximity by 1912. The 1960s, 70s and 80s brought several modern landmarks, including the New City Hall, which required the demolition of many brick structures. The Leslie Spit was created from the resulting ‘clean fill’. Walking along its beaches today is a testament to both that history and the capacity of natural forces to reinstate the organic. Panya Clark Espinal lives and works in Toronto, Canada. She graduated from the Ontario College of Art in 1988, receiving the Governor General’s Award for her work in Experimental Art and Sculpture Installation. She is current candidate in the Criticism and Curatorial Masters Program at OCADU. Solo exhibitions include the Art Gallery of Ontario, the Canadian Embassy (Tokyo), the McMichael Canadian Art Collection, the National Gallery of Canada, Oakville Galleries, and the Southern Alberta Art Gallery. She has also exhibited in England, Italy, and Spain. As an active producer of public art commissions, she has created pieces for such prominent organizations as the Toronto Transit Commission, Covenant House, and various community institutions in and around Toronto. Her work is included in the collection of the National Gallery of Canada. To view more print work by Panya Clark-Espinal, please visit the Open Studio online store by clicking the button below.